The definition of the American Dream has changed over time, but for the most part it boils down to the aspiration and opportunity to roam wild, amass personal property and consume everything by any means. Later on, a revised version of this was presented to the rest of the world as the dream to live a posh life of comfort. Fair enough! In modern times, this means having a sizeable home with a yard, and preferably with a fence for privacy. Having two cars in the driveway or the covered garage, one for each adult in the household, is also a promising sign that the dream is near or already being realized. To continue living the dream in all its glory, one has to maintain a stable job that pays well enough to support a constant stream of income to afford all of these things, which now includes modern gadgets that range the gamut of restaurant-size kitchens, commercial refrigerators, industrial dish washers, village-size pantries, electric and electronic cars, and comprehensive video game systems. 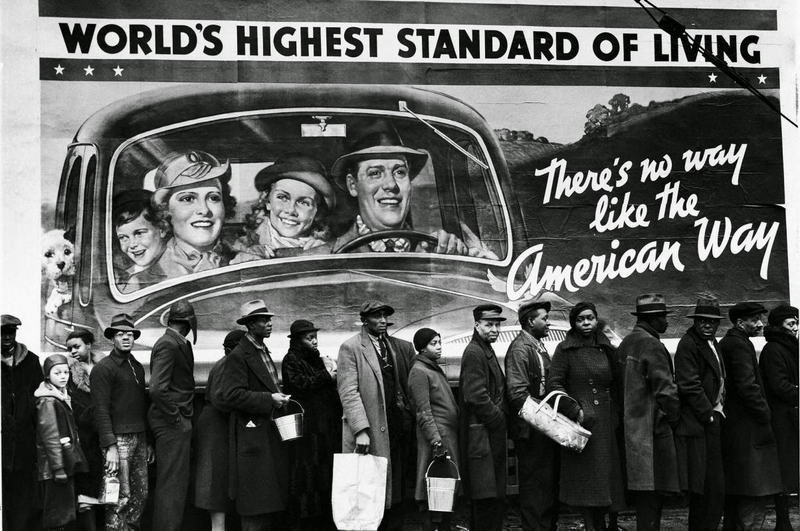 The American Dream transformed the way ordinary people contemplated and experienced life. Ages ago, no one could fathom that nations of unremarkable individuals—particularly those with average or below average intelligence, thought capacities and performance skills, who also lacked other invaluable assets that would deem one especial—could, or should for that matter, live better than chiefs and queenmothers. Except, these average people have mastered the “art” of barbarism—of unleashing gnashing violence at home and abroad in the continuous collection of personal property. So every day the American Dream—or is it the American Nightmare?—makes it possible for ordinary people with average thought capacity, little to no skills, and hardly any notable qualities to afford luxury goods, own extravagant residences, and even purchase vacation homes on sandy beaches cleaned daily by servants. Still other regulars in other countries hold grand aspirations that far outweigh their talents and intellect. Everybody has the potential to live large, according to the American Dream. To this point the original formulation of the dream to roam wild, amass personal property and consume everything by any means is not lost on those who hold dear the aspirations of the Nightmare. How is this feat, which ostensibly defies ordinary logic, possible? The achievement of the American Dream with all its spoils and riches comes at a steep price. That cost is racial violence, oppression, and warfare. The American dream would be wholly impossible without its grand footing in racial violence. The dream of living on the coasts of the Pacific Ocean in modern day California came at the expense of the forceful displacement of thousands of Native Americans who already inhabited those lands. The dream of open concept designs, of building multi-million-dollar mansions with lengthy steel beams comes with the concomitant nightmare of the millions of traditional people in villages whose lands, which should bear food, are rather mined and dug so those precious metals, Earth Fruits, can be excised to no end, so that trees whose heights and memories expand great stretches of time are uprooted at man’s every whim. The American Dream would not exist without the ideologies and philosophies of whiteness and white inferiority complex—stemming full well from the knowledge-complex of being average at best! Without this white industrial complex in the US, for example, there would be no Native American genocide, no Trans-Atlantic Slavery and no European expansionism into lands that were previously inhabited by various tribes of indigenous people and by animal and plant lives, far more civilized than they. Without the white industrial complex, there would be no attitude and corresponding behaviors that still subordinate Africa and Her descendants in a land that is paralogically labelled “Free.” There would be no mass incarceration—the white sister of slavery—that still brands Africans as nonhuman, subhuman, and three-fifths to be exact. There would be no industrial revolution with its cash crops and surplus labor. Without the white industrial complex, there would be no history of violent laws written by barbaric men to give themselves total dominion over Black bodies and their offspring. There would be no US Command in Africa (AFRICOM) to make certain that chosen puppet leaders become powerful heads of state to manage the threat of rebellion. Without the white industrial complex, there would be no open season on cocoa, sugar cane, gold diamonds, and other precious Earth Fruits. There would be no “disposable income” to support the bottomless materialism that is fast becoming global culture. Subtract these racial underpinnings and the American Dream is without a backbone upon which to flourish. Take away the racial violence underpinning the nightmare and dream is unsustainable. Truly, one man’s dream is another man’s nightmare. The American Dream, which is inexplicably linked to racial violence and the modern conception of whiteness, serves millions of Europeans and European expats in the US but comes at the cost of freedoms and liberties for millions more. Each day the world is moving rapidly in the direction of greater barbarism with brute racial violence at its helm. Cheik Anta Diop’s prophetic inquiry, Civilization or Barbarism, is remarkably apt today. Aspirations to greed, gluttony, and resource hoarding are far from the artistic civilizational ambitions of our dear Ancestors. There will come a time —some say the time is upon us already—when no small minority of nations sets its desires on materialism of the grossest proportions, the aims and acts of primitive accumulation. These dreamers will find it equally telling that the price of their goal of unlimited economic and financial bloating will inevitably ensue from some form of brute and barbaric violence attached to the majority of citizens, whether within the nation or outside of its boundaries. Mother Earth is in dire need of a new set of thinkers and doers who have Her preservation, as well as profound respect for humanity firmly in mind. This crop of civilization seekers would no doubt emerge from a Global South, and thus the workings of global white inferior-complex ideology will operate daily against the goal of such a group of leaders to ever rise to prominence. Still a new generation of civilization seekers is needed to quell the lunacy of a mightmare that does more harm to the world than it does any good; a dream set to destroy the world as we know it. Is the steep price of violence, mass graves, and never-ending warfare worth the anguish for a walk-in closet full of stilettos and T-shirts? Is it worth having machinery to perform our everyday tasks if the cost is the health of the Earth and our very selves? It is high time to re-evaluate the intercontinental nightmare, which masquerades as an imperialist dream. For what is a dream worth if we gain the whole world and lose our souls in a trail of bloodshed? Any attempt to describe what it is that some nations aspire to when they speak of “Economic Development—” if it is to follow in the footsteps of the American Dream—often leaves the bystander pegged between a freakish dilemma and a scrofulous reality. The dilemma that progress must be made, but a history that refutes the unrepentant notion of perpetual individual wealth creation and upholds the reality that unseemly wealth almost always ascends violently from the bodies of actual human beings. The paralogism can no longer be examined outside the infinite course of its bloody tributaries. Nefetiti poetically guides our hands to carefully internalize and grasp the visual effects of the attendant and resultant forces unleashed when human and natural resources are marshaled in the parochial attempt to honor a national experiment in primitive accumulation. She accomplishes what many fail to do: to show that though the history might never sing the eulogies of those long dead and gone, whose sweat and blood fueled the forging of the very foundations of the American Nightmare that some nations wish to emulate, it still encapsulates the crass libertine essence of the experiment itself. But again, I may have bungled Nefetiti’s intent. So, Enjoy! SOULWORDSSONG OF GBETOHEMAA NEFETITI: “Each day the world is moving rapidly in the direction of greater barbarism with brute racial violence at its helm. Cheik Anta Diop’s prophetic inquiry, Civilization or Barbarism, is remarkably apt today. Aspirations to greed, gluttony, and resource hoarding are far from the artistic civilizational ambitions of our dear Ancestors. Still a new generation of civilization seekers is needed to quell the lunacy of a nightmare that does more harm to the world than it does any good; a dream set to destroy the world as we know it. Is the steep price of violence, mass graves, and never-ending warfare worth the anguish for a walk-in closet full of stilettos and T-shirts? Is it worth having machinery to perform our everyday tasks if the cost is the health of the Earth and our very selves? Deeply thoughtful ‘Soulwordssong’ of Nefetiti, a worthy Gbetohemaa Daughter of our Pan-Afrikan Freedomfighting ‘Nunyansabrewaa’! I dare not spoil it by adding anything else! Except to ask for bigger listening ears to be given to those myopic African cowards who think Humanity can do nothing else better than go through the American type of Nightmare before reaching the sort of Paradise of their self-delusional hallucinations implanted by their puppeteer masterminds of Euro-Amerikkkan Imperialism in their twisted minds of White Supremacy racist-stupefied nimcompoops! Gbetohemaa Nefetiti has resounded the Akoben sounds of the conclusion to “The Wretched of the Earth” by Frantz Fanon! Those who claim they find Fanon and his disciples like some of us too difficult to read may be able to better grasp the sweeter ‘Soulwordssong’ rendition of his message redelivered here with the creativity genius of our Gbetohemaa Nefetiti!